Update, May 1, 2017: The Department of Homeland Security updated its website on Monday, May 1, 2017 to include the name of Julie Kirchner as citizenship and immigration services ombudsman. A former director of an anti-immigration group, Julie Kirchner, is expected to be named as ombudsman to U.S. Citizenship and Immigration Services on Monday, according to a person with knowledge of the pending appointment. Kirchner was from 2005 to 2015 director of the Federation for American Immigration Reform, a group that has advocated for extreme restrictions on immigration. The ombudsman’s office at USCIS provides assistance to immigrants who run into trouble with the agency, such as immigration applications that take too long to process or applications that may have been improperly rejected. The ombudsman also prepares an annual report for Congress in which they can issue audits and policy recommendations without consulting with USCIS in advance. 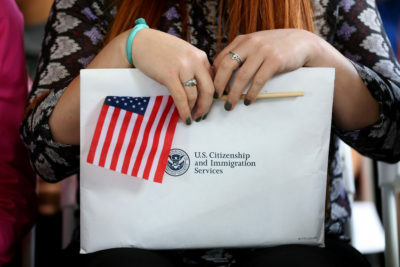 As the nation’s immigration agency, USCIS handles a wide range of legal immigration matters, including applications for citizenship and green cards. The agency can also grant legal status to those in extreme circumstances, such as refugees and asylum seekers. In addition, the agency is in charge of adjudicating applications from undocumented immigrants who were brought to the country illegally as children, sometimes referred to as “dreamers” or DACA recipients. The person with knowledge of Kirchner’s planned appointment is a former USCIS official. The Department of Homeland Security, which appoints the USCIS ombudsman, declined to comment. USCIS said the agency doesn’t comment “on potential personnel announcements.” Customs and Border Protection, where Kirchner was most recently chief of staff, also declined to comment. FAIR did not respond to a request for comment. She worked at CBP as a temporary political appointee. FAIR was founded by John Tanton, a well-known eugenicist who has written papers on the subject and founded a pro-eugenics society. Personal papers he donated to the University of Michigan express his concern at the changing demographics of the United States and his personal interest in the genetic differences between races. The organization’s work surfaced early in the Trump campaign. In August 2016, Trump used a debunked FAIR study to claim illegal immigration cost the United States $113 million a year. Heidi Beirich, an official with the Southern Poverty Law Center, said she was alarmed by the idea that Kirchner would be made ombudsman. The SPLC has labeled FAIR a hate group.